I have been struggling with this assignment for quite some time now. What I would like to develop is a scrollview or collectionview which scrolls continuously both vertical and horizontal. Here is an image of how I think this should look like. The transparent boxes are the views/cells which are re-loaded from the memory. As soon as a view/cell gets outside of the screen, it should be reused for upcoming new cell.. just like how a UITableViewController works. I know that a UICollectionView can only be made to infinite scroll horizontal OR vertical, not both. However, I don't know how to do this using a UIScrollView. I tried the code attached to an answer on this question and I can get it to re-create views (e.g. % 20) but that's not really what I need.. besides, its not continuous. I know it is possible, because the HBO Go app does this.. I want exactly the same functionality. My Question: How can I achieve my goal? Are there any guides/tutorials that can show me how? I can't find any. Resetting the contentOffset probably is the best solution figured out so far. 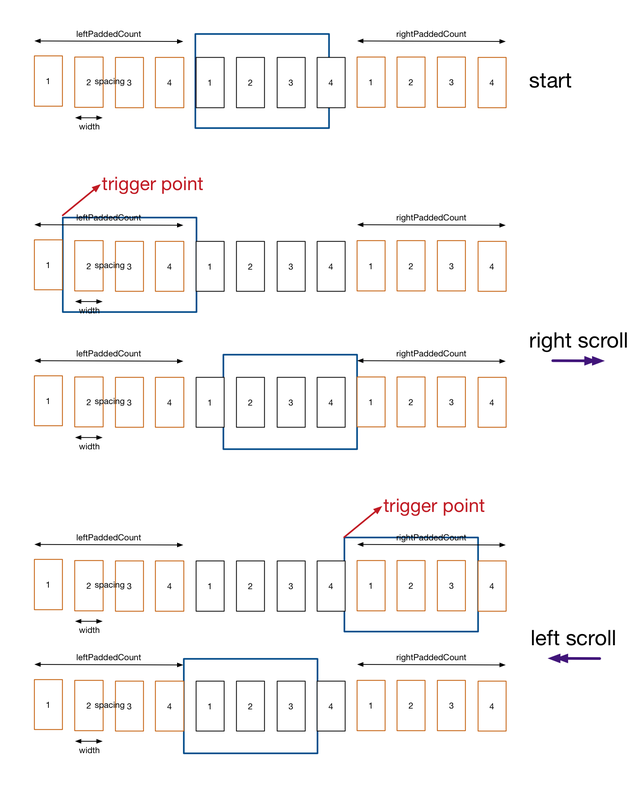 When the user scrolls right and contentOffset hits the trigger value, we reset contentOffset to show same visual results; but actually different data; When the user scrolls left, the same logic is used. So, the heavy lifting is in calculating how many items should be padded both on the left and right side. If you take a look at the illustration, you will find that a minimum of one extra screen of items should be padded on left and also, another extra screen on the right. The exact amount padded depends on how many items are in the original data set and how large your item size is. @TreeBucket : Its working but getting space between sections: How i can remove that space? NSInteger xSize = [self.collectionView numberOfItemsInSection:0] * (itemWidth + space); // "space" is for spacing between cells. NSInteger minRow =  (rect.origin.x > 0)? rect.origin.x/(itemWidth + space) : 0; // need to check because bounce gives negative values  for x.
I played with that idea as well, but when I made an example project it seemed it loaded all the view at load, is that correct? It got really slow. (however I tried with an amount of 100.000 instead of 1000). Is there some way of tricking the UICollectionView to think it is showing section and row 10, while it actually is showing 510 or so? If so, one could make it infinite. @PaulPeelen, No, it shouldn't load all the views at once -- just like a table view, it only creates enough cells that it needs to display on screen. 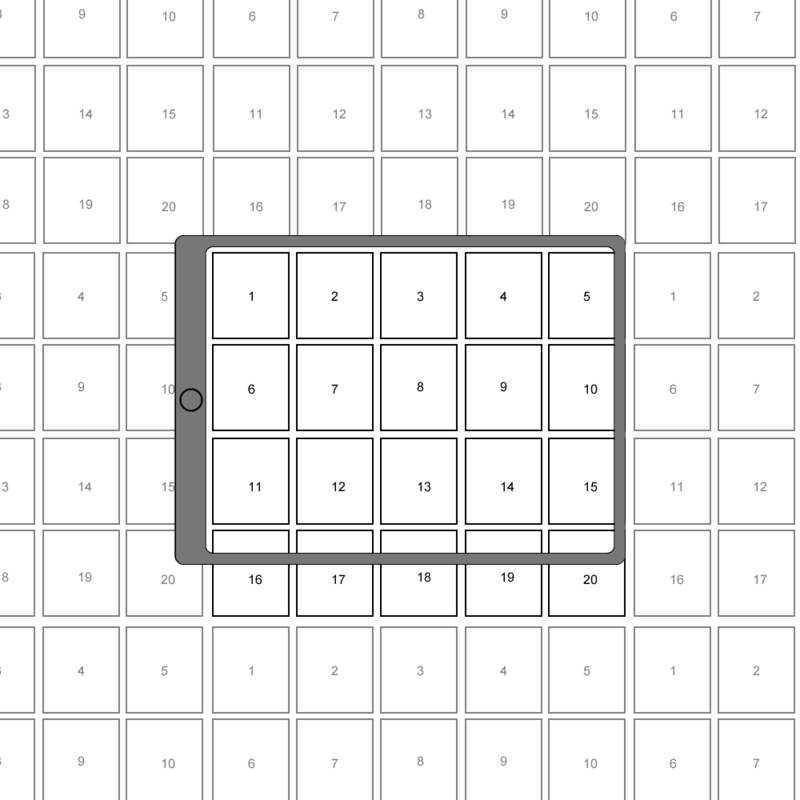 I'm not sure why this gets jerky if you have more than 1000 cells in each direction, but 1000 seems like enough to make it seem infinite to the user. This example project I made isn't slow to load or scroll. @PaulPeelen, I've edited my post to show how to do it in a truly infinite way. I only need to return a modest 4 times the size of my actual array to do it this way. It seems totally seamless. Worked like a charm! Thanks mate. I'll write a blog post on it sometime and link you in the credit! Paul, where's the blog post? I tried to implement your code. I get a gridLayout but inserting the method layoutSubviews causes my view to repeat always the same. I also get sometimes the exception [UICollectionViewData validateLayoutInRect:] after scrolling a little bit. does somebody of you have some more input how to get it work? +1, thanks. @rdelmar can you provide your source code demo? @rdelmar how to turn off infinite scrolling in this example. Means 1 to 10 , and then end of scrolling. 1 should not come after 10. @ViruMax, If you don't want the infinite scrolling don't use the custom subclass of UICollectionView (that has the layoutSubviews method posted above), and return the correct number of items in numberOfItemsInSection and numberOfSectionsInCollectionView (I'm returning 4 times my actual values so you can scroll a ways before re-centereing the scroll view). Also, in cellForItemAtIndexPath, you don't need the %4 or %5 after the indexPath, it would just be self.theData[indexPath.section][indexPath.row]. @ViruMax, are you returning the correct values in numberOfItemsInSection and numberOfSectionsInCollectionView appropriate for you data structure? @rdelmar yes I have used 5*5 dimensional array and returning 5 in numberOfItemsInSection and 5 in numberOfSectionsInCollectionView, but application didn't crash for 5*4 dimensional array which is your default array. @rdelmar: I tried your code, but the result isn't that what I expected. See an image here. The rows and columns are repeating itself multiple times one row after another. Has this code ever worked or am I doing something wrong? @testing, Yes this code worked. I always test the code I post in answers, so you must be doing something wrong. @rdelmar: Do you have used storyboard? Where do you subclassed UICollectionView? I don't see it in your code. You are using a normal UICollectionVIew class. Is DataCell a nib or created in code? I think it's the latter one. Is collectionView placed on a nib and connected via the outlet? When you add a collection view via Interface Builder he wants a reuuse identifier and the registering of DataCell is done in Interface Builder and in code which leads to a black screen. @IBOutlet var activateNodeButton : UIBarButtonItem? Nice! I'll have some use for this as well, I think. Gets a little confusing around the concept of x vs y vs row vs column vs row vs section -- Hard to keep the orientation straight all the way through :) If anyone is thinking of copy pasting this send me a note and I'll update with the latest changes. @BadPirate : Its working but getting space between sections: How i can remove that space? [SOLVED] UIScrollView : paging horizontally, scrolling vertically?